Tired of the Gym?…Cha Cha to Arthur Murray’s Dance Studio and Start Exercising! 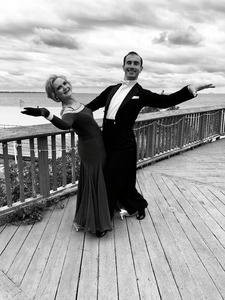 Couples and singles alike aiming to get fit are putting the swing into exercise by leaving the grind of the gym behind to dance at Arthur Murray’s Dance Studio, 345 Main Street. According to the American Council on Exercise, in addition to burning calories, ballroom dancing can help manage weight, improve cardio endurance and lower blood pressure. “Dancing has psychological plusses too…it lifts spirits, improves self-esteem and confidence and relieves stress,” says Cabell. So sidestep the gym and quick step over to a dance class, invites Cabell. “And you don’t need to have a partner or be a couple, we provide customized classes as well as group instruction,” he adds. For more information, www.ArthurMurrayofDanbury.com or call 203.792.0176.